High-tech containment swim brief shown in Navy. Select Size X-Small 22-24" Small 25-28" Medium 29-32" Large 33-36" X-Large 37-40" 2XL 41-44" 3XL 45-48" 4XL 49-52" 5XL 53-58"
This swim brief (undergarment, also known as a Swim Diaper) is designed for adults and teens dealing with incontinence. 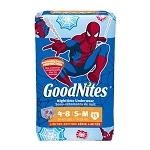 This product was reviewed by the National Foundation for Continence and selected for their Resource Guide. The garment is designed to be worn next-to-skin under a swim suit. 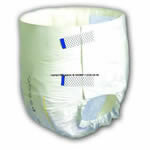 It is intended for bowel containment, however it will protect a certain amount against urinary leakage. It's difficult to determine just how long because each person has different needs. It provides plenty of time to get from the change room to the pool or beach. Our tests showed it would easily contain several cups of water, but if you are uncertain as to how long it will contain urine, please try it at home first. 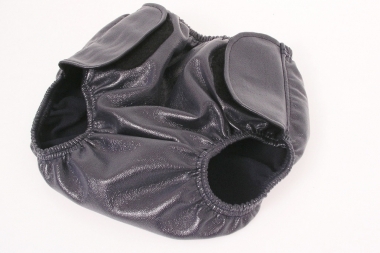 It is important to purchase the right size, and keep it as snug as possible using the adjustable closures. 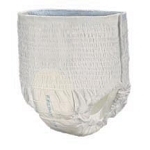 Although it was made specifically for swimming, some customers tell us it makes a great cover for disposable or cloth diapers. These garmets are unisex. Order by waist or hip measurement, whichever is the largest. If you are ordering for someone who is under 5' tall, order a Youth. Otherwise, order an Adult style. The Youth style is exactly the same as the adult style, except slightly shorter through the rise (crotch) to accommodate shorter stature. To Measure Rise: begin about 1 inch below the belly button, measure down through legs, and up to the position on the back that matches the starting position on the front. Then, based on the larger of waist/hip measurement, choose the style that comes closest to your own rise measurement. If you have any questions, call or email us. X-Small 22" - 24" 27.5" 25"
Medium 29" - 32" 29" 26.5"
Its annoying to see constantly people sticking to the old measurements in inches. These days the metric system is used- cm, kg eg. I want a pants with a measurement waistline of 127cm. No details are provided on your website at all about what waist-lines you are talking about.